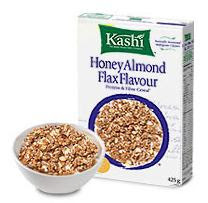 Get a free sample of Kashi cereal! Kashi is giving away free samples of their cereal. You can choose from Toasted Berry Crisp or Honey Almond Flax. Both sound quite yummy! Last year Kashi gave away coupons for consumers to try one box of their cereal, but this time around the sample will contain approximately one serving size. Still a great way to try out their cereal, and it's free! 0 Response to "Free Sample of Kashi Cereal"